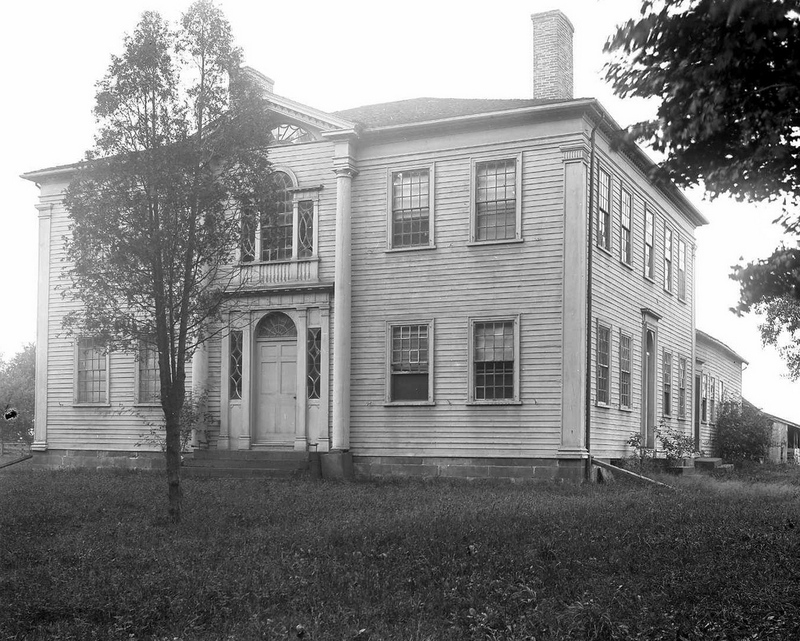 The Captain Charles Leonard House on Main Street in Agawam, around 1895-1896. Image courtesy of the Agawam Historical Association. This house on Main Street in Agawam hasn’t changed much in the past 120 years, nor had it changed much between its construction in 1805 and the 1890s photo. 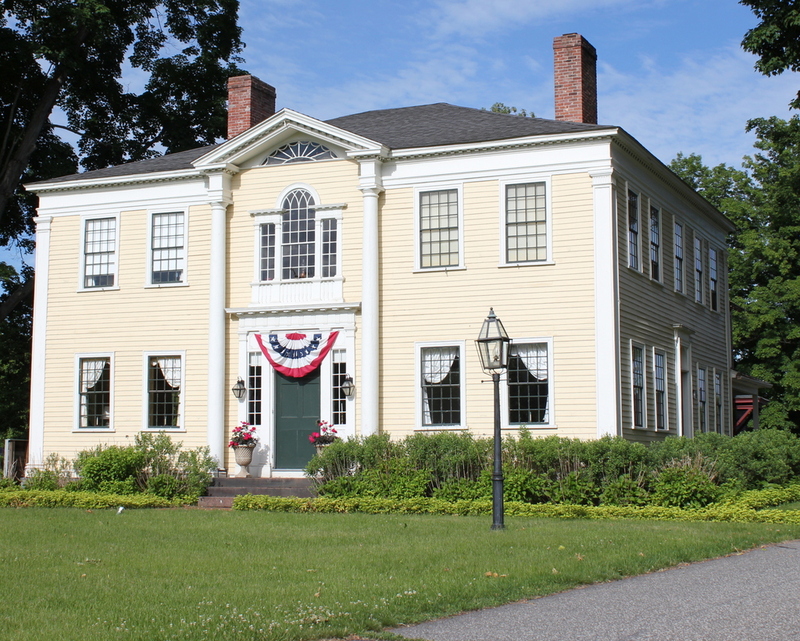 It is a very well-preserved example of early 19th century Federal architecture, designed by noted architect Asher Benjamin for Captain Charles Leonard, a local militia officer who operated a tavern out of the building. At the time that the first photo was taken, it was owned by George Fowler, and in the 1930s it was purchased by Minerva Davis and restored to its early 19th century appearance. Since then, it has been owned by the nonprofit Captain Charles Leonard House Corporation, and has been rented for weddings, banquets, receptions, and a variety of other gatherings. 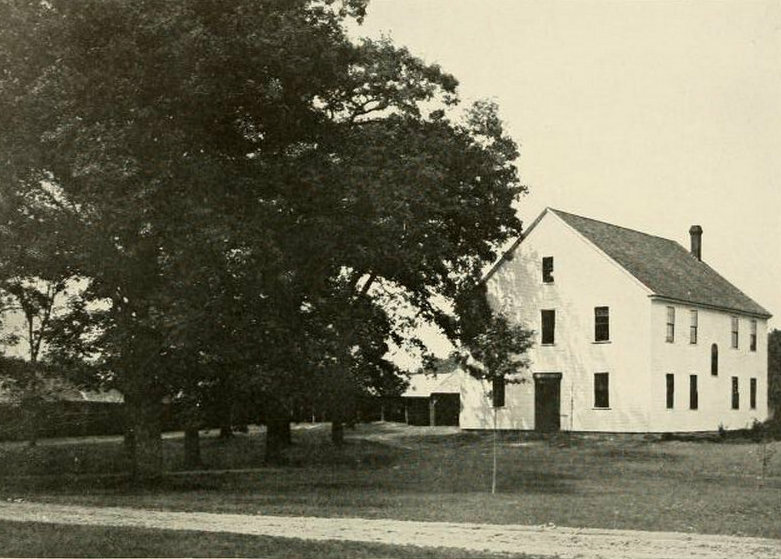 The Rockingham Meeting House around 1900-1910. Image courtesy of the Library of Congress, Detroit Publishing Company collection. 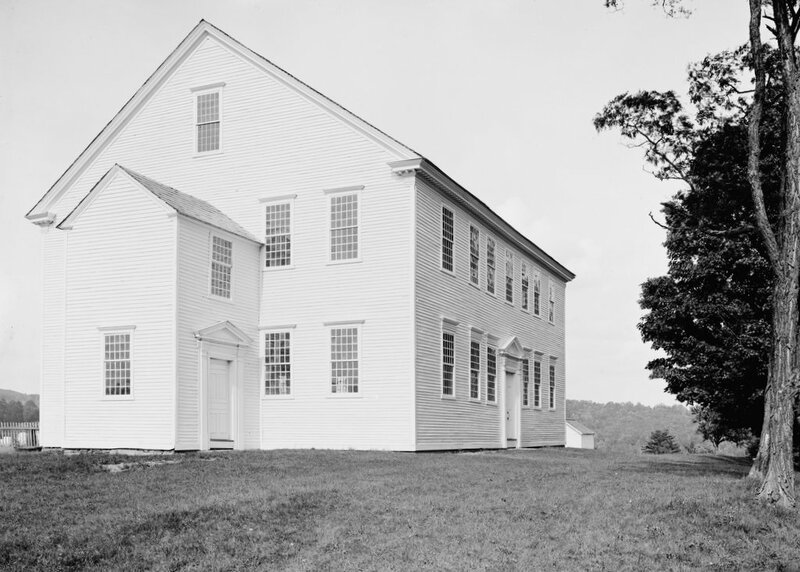 The Rockingham Meeting House is one of the two oldest existing church buildings in Vermont. It is so old, in fact, that it was not built in the United States – construction began in 1787, four years before Vermont became a state. At the time, Vermont was an independent republic, and although the citizens overwhelmingly favored joining the Union, there were issues over conflicting land claims between New York and New Hampshire. By the time the building was completed in 1801, however, Vermont had since joined as the 14th state. Although it was built at the end of the 18th century, its architecture is fairly conservative, and it looks more like meeting houses from the first half of the century. Probably the most conspicuous difference between it and most other churches built in the late 18th and early 19th century is its lack of a steeple. Many early 18th century churches did not have steeples, although by the time the Rockingham Meeting House was built they were fairly commonplace. Another difference is the interior layout; the main entrance, as seen in this view, is located in the middle of the long side of the building, and inside the pulpit is directly opposite it. Again, this was common in the mid 18th century, but by the start of the 19th century most churches were being built with the central aisle running the length of the building. 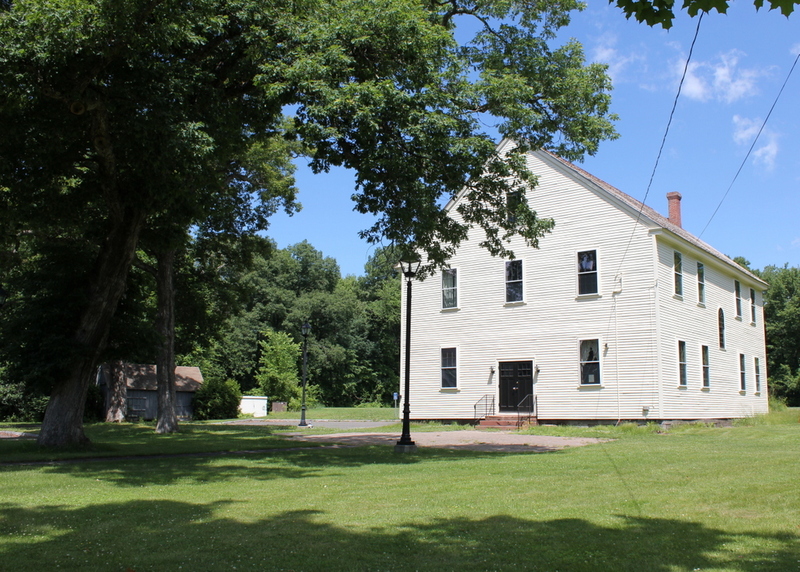 Like many other meeting houses of the era, this building was used for both church services and town meetings, and at the time of its construction it was in the center of the main village in the town of Rockingham. However, as time went on, and as industry replaced farming as the livelihood for many residents of the town, the village of Bellows Falls along the Connecticut River became Rockingham’s center of population. Church services here ended in 1839, and town meetings continued until 1869. 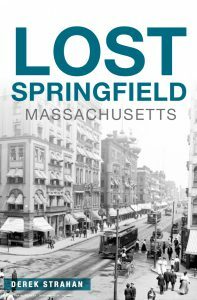 After that, the building was mostly vacant until the early 20th century, when the historical significance of the building came to be appreciated. The first photo was probably taken around the time of its restoration 1907. 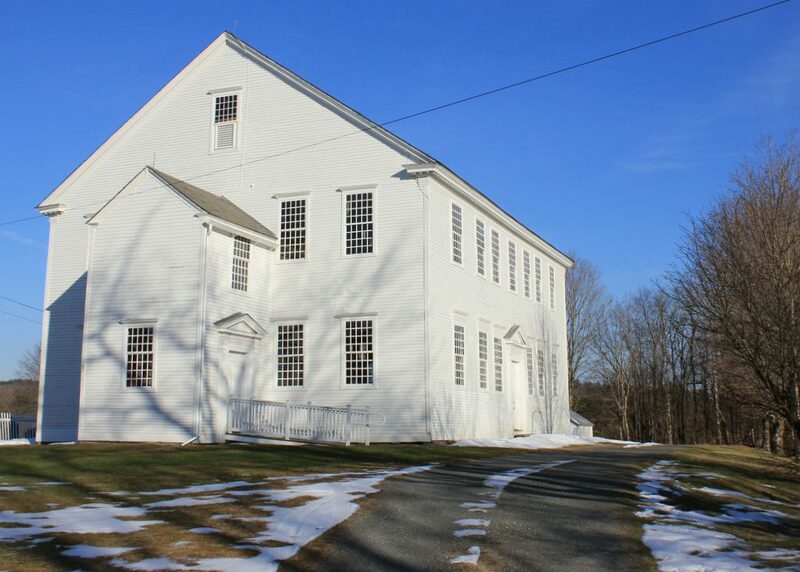 Overall, the building is one of the best-preserved colonial meeting houses in New England, in part because of its relatively brief use as a church and meeting house. 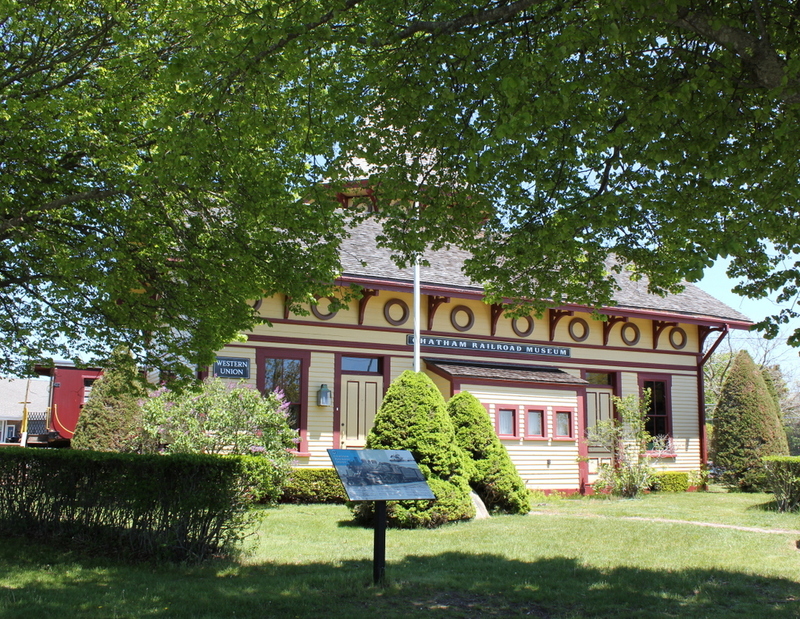 Today, the building is owned by the town of Rockingham, and is rented out for weddings and other functions. However, because the building was never really updated or renovated since its completion, neither electricity nor heat was ever installed, so it is only usable in the summer months. The H. H. Baxter Memorial Library at the corner of Grove and Library Streets in Rutland, around 1900-1906. Image courtesy of the Library of Congress, Detroit Publishing Company collection. 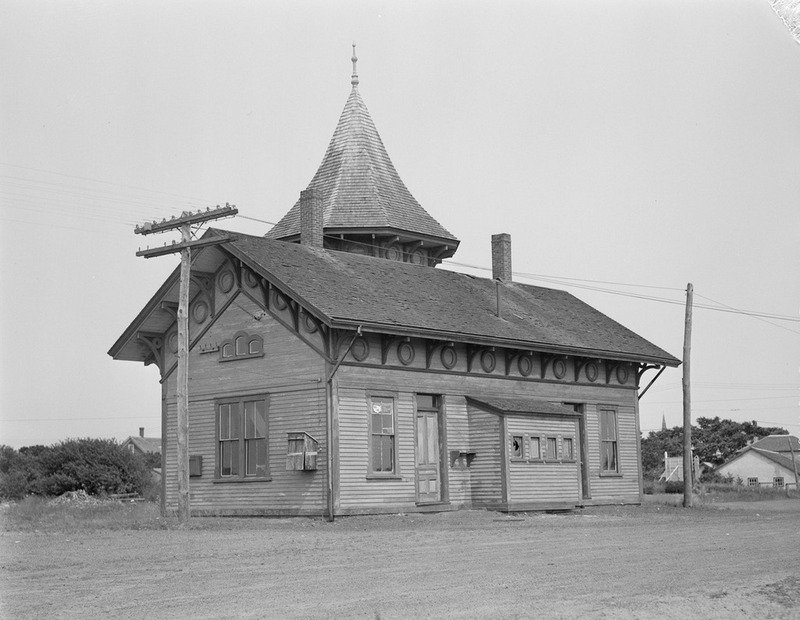 The Baxter Memorial Library was built in 1889 in honor of Horace Henry Baxter, a businessman who was involved in railroads as well as the Rutland marble business. He served from 1859 to 1861 as the Adjutant General of the Vermont Militia, and later in the decade he moved to New York City, where he served as the president of the New York Central Railroad from 1867 to 1869, and was on the railroad’s board of directors from 1869 until his death in 1884. Five years later, the library opened with funds donated by his family. 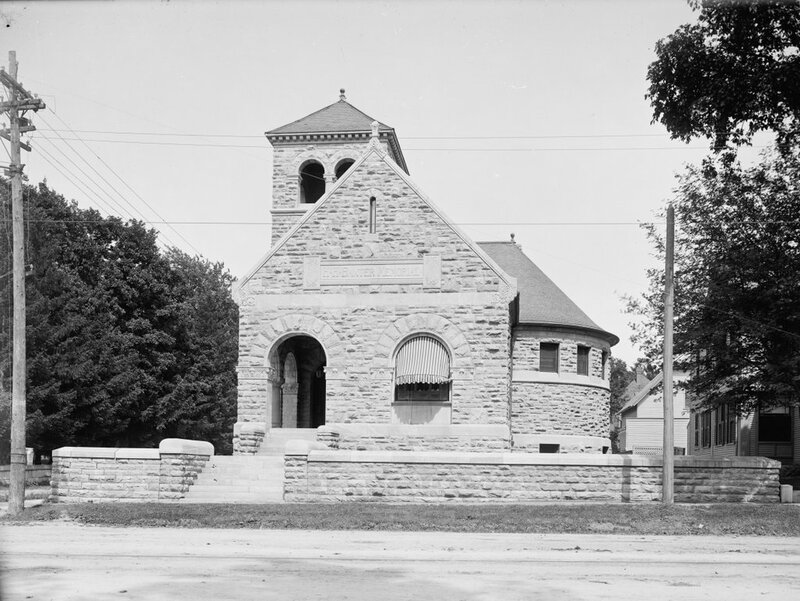 Today, the building is still there, and the only major difference is the retaining wall, which was removed in the 1950s, and the stones were used to make an addition on the other side of the building. 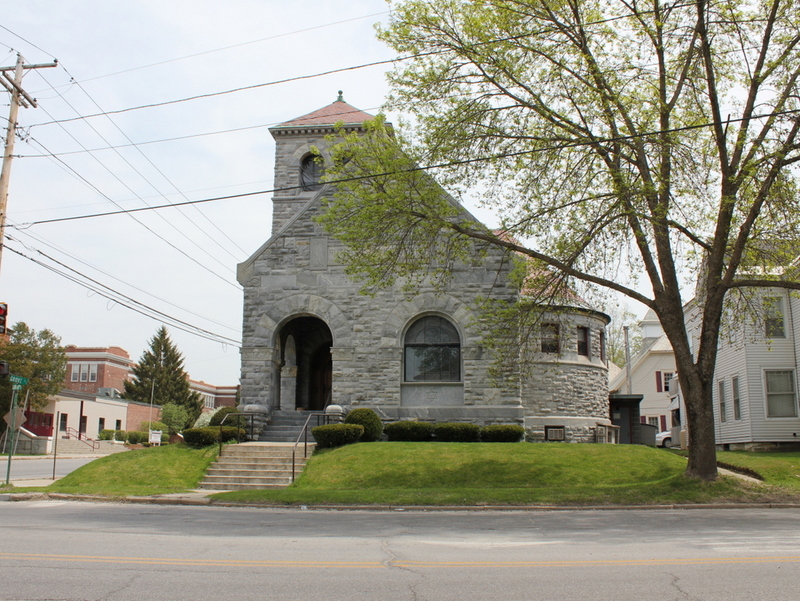 Otherwise, the only significant change is its use – today, it is the Rutland Jewish Center, and is on the National Register of Historic Places. 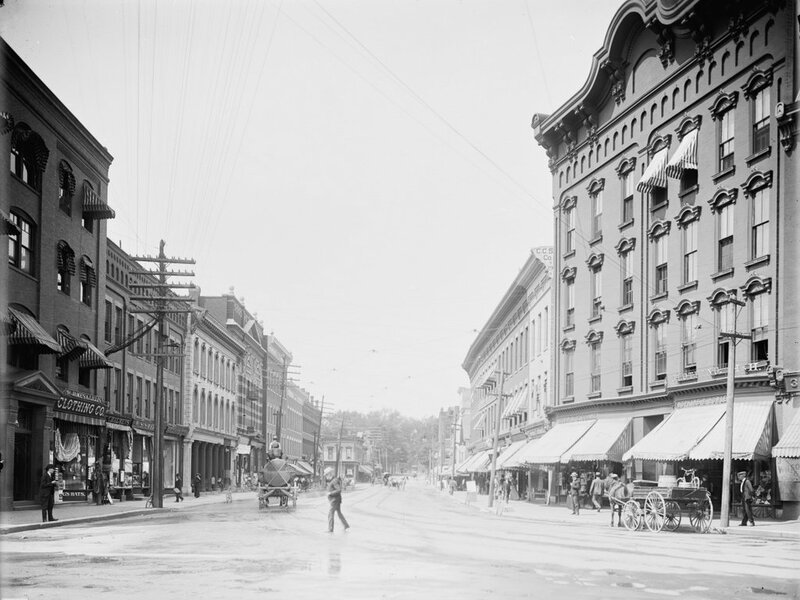 Looking north on Merchants Row from Center Street in Rutland, around 1904. Image courtesy of the Library of Congress, Detroit Publishing Company collection. Aside from a conspicuous lack of horse-drawn carriages in the 2015 scene, this view of Merchants Row hasn’t changed a whole lot in the past 111 years. 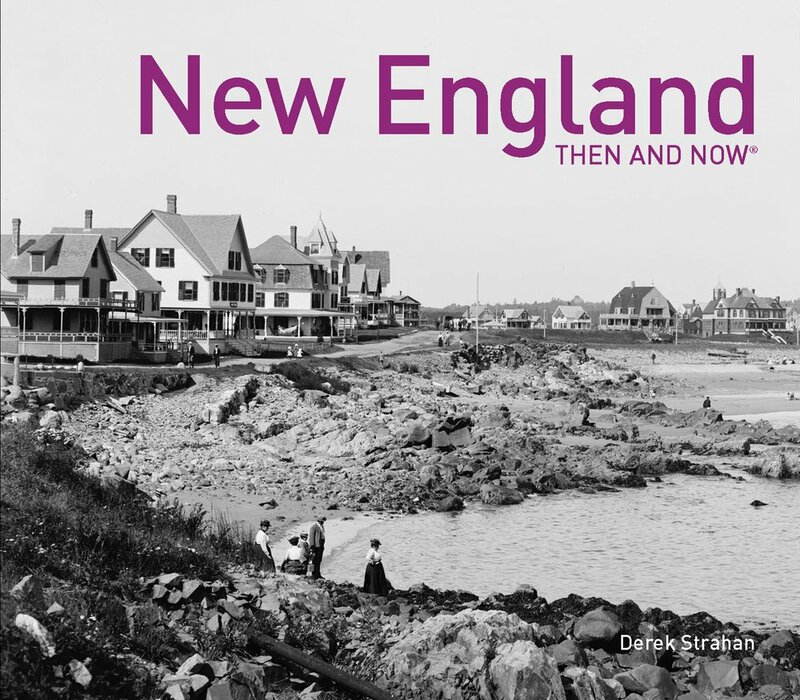 The only prominent building from 1904 that doesn’t survive today is the one on the far right, which was destroyed along with several other buildings in the 1906 fire. Following the fire, the current building was built on the site. Otherwise, all of the other buildings are still around today, although some have been altered. The left side of the street is particularly well-preserved, with many of the buildings dating to the 1860s. The oldest of these is probably the Ripley Bank Building, which was built before 1864. Just beyond it is the ornate facade of the Rutland Opera House, which was built in 1881 after the original burned in 1875. 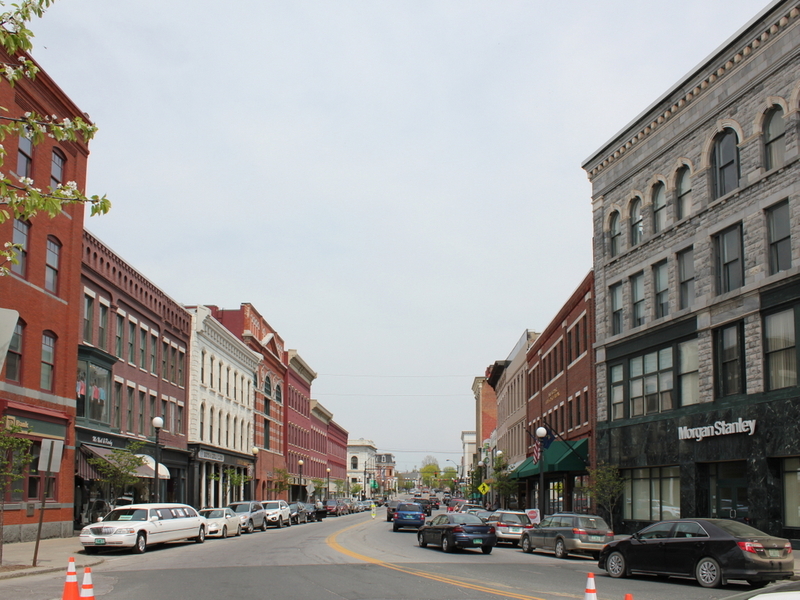 Today the entire area here is part of the Rutland Downtown Historic District on the National Register of Historic Places.